Michael J. Sullivan is one of my must-read authors, enough said. Looking forward to this sequel to Age of Myth, which I really enjoyed, and I’m simply blown away by the gorgeous covers to the books in this series so far. “In Age of Myth, fantasy master Michael J. Sullivan launched readers on an epic journey of magic and adventure, heroism and betrayal, love and loss. Now the thrilling saga continues as the human uprising is threatened by powerful enemies from without—and bitter rivalries from within. Raithe, the God Killer, may have started the rebellion by killing a Fhrey, but long-standing enmities dividing the Rhune make it all but impossible to unite against the common foe. And even if the clans can join forces, how will they defeat an enemy whose magical prowess render them indistinguishable from gods? Ooh nice! Totally new to me one! Hope you enjoy it once you get to read it! Great pick. Even though I had a few issues with book one, I can’t wait to see where Sullivan goes with the series. 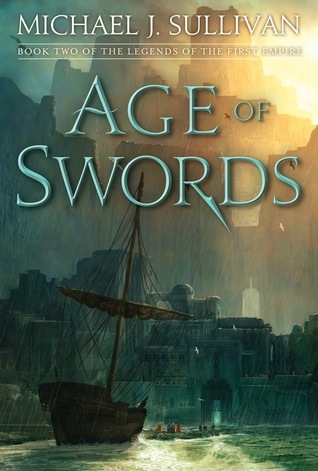 I’ve got Age of Myth on my TBR and I had no idea there was a sequel planned. Very cool, I must try to find time to read it. I really like the font style for this cover too! I’ve not read anything by this author! It’s been a while since I read a purely adult fiction fantasy novel. I will definitely check out the first book in this series. I hope you enjoy this book when you get a chance to read it! Now, do I try and catch up, or do I wait until everything is concluded. Mmmm, decisions, decisions. I think I’ll wait – as I’m already behind I should probably try and catch up on some of the series I’ve already started. I do love the look of this and the first though.